Let's Go Pikachu with the Pokeball. Superb controller. WILD GUNS RELOADED, this Natsume SNES classic remake had been on my wish list since it’s release earlier this year (? ), last year (?) and was finally given a decent discount. £8.99 currently on the UK eShop. Lego Harry Potter and Lego DC Super-Villans for $50 shipped. I got Wonderboy. I've played for a couple of hours and I'm still amazed at how seamless you can switch between retro and modern. 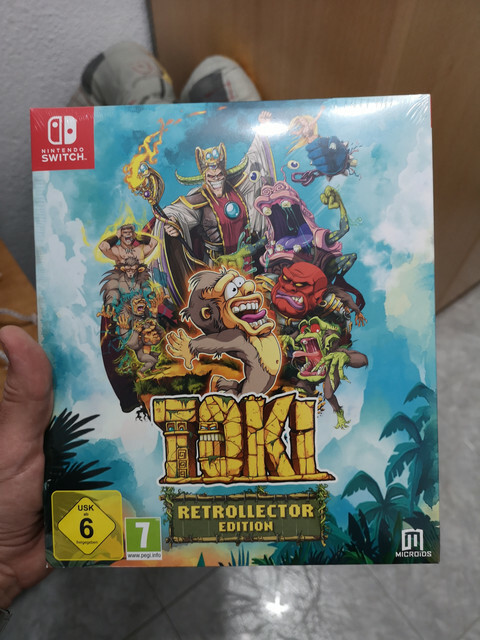 Toki Retrollector Edition. Received it yesterday. and Crayola Scoot...for $80 shipped. I know, mostly shovelware, but the collection demands satisfaction and I have a difficult time saying "no" to 50%+ off. Starlink, Valkaryia Chronicles 1 & 4, Pokemon Let's Go Pika, Civilization VI, and several other "NIS America" games along with Diablo! The Poke Ball is in the mail on its way. Super Mario Party, Rocket Fist, Death Squared, Nintendo Switch Online, and Neon Red/Neon Blue Joy-Con set. Megaman 11 and Yoku’s Island Express. Edit: Just got Ultimate in the mail, so hyped. Ridley amiibo turned up yesterday, brings me up to 16 in total. Gear Club 2 and Smash. Diablo III, Katamari, labyrinth of refrain (had too much fun in the demo) and Dokuro. Done till FE drops. Got Katamari Damacy Reroll and Sega Genesis Classics at my local GameStop.